Go Pro Joy | Let's Be Active! My Go Pro Hero Joy! One person on FB asked why on earth I’d be buying such high spec tech, and what intention did I have of this wee camera…Well good question I suppose. Why? I guess because I can…and because, hey, I felt like it. Intentions? Well it’s my hope that it will encourage me to be more active, have some fun, and also get some creative juices flowing! Here’s a shot from my first day having a play with it. My best bud Bri and his new baby Pug Frito at the car wash! Am I going sky-diving or snow boarding or whatever? Not highly likely no. No one says you have to be uber-fit to have some fun with the kit. Tomorrow I”m hoping to take a hike with it. In Scotland, I actually may do a tour of my favorite Scottish Castles with it…Selfies at Eilean Donan Castle anyone? As weather improves in Glasgow, can strap it to my bike’s handle bars and cruise along the River Clyde on a ride…The Go Pro’s good for time lapse and concerts too. Very versatile. Been studying a variety of the tutorial videos to learn how to work all the settings. It has Wi Fi and Bluetooth and I’ve rigged it up to my phone. Seems to work pretty well to use my (Android) phone’s GO PRO app…Got a head strap, a “selfie wand” (stick) and a clip to strap it my baseball caps too! Had a craving for pancakes while driving back with my new accessories, so we stopped in at a CoCo’s. 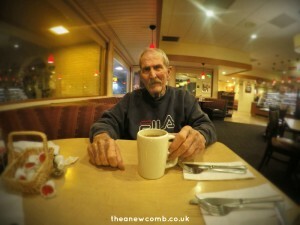 Here’s dad with his coffee. Love the wide angle. Need to get a bit better with the settings but overall pretty happy with the funky wee shot. So yes, hopefully the Go Pro will spur me on both with activity and creativity! That’s my intention as I say.